Spring is Here! Is the rain overflowing your gutters? Do your gutters need replaced? Call us now! The right gutter and downspout system provides protection against roof damage, soil erosion, and basement flooding. Gutters and downspouts are an essential part of your home's weather protection. By directing water off your roof and away from your foundation, gutters and downspouts help prevent problems such as a roof damage, flooding, and water damage. Gutters that frequently clog or are damaged can lead to serious problems, including roof and foundation leaks. 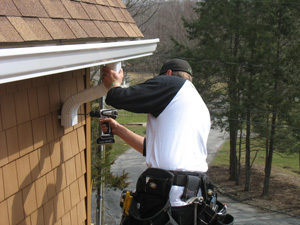 At RJK Construction Co., we offer expert gutter installation services. Our teams are available to install seamless gutters and downspouts as well as put gutter guards such as Leaf Relief® in place to reduce your gutter maintenance. If you're interested in new gutters for your home, give us a call today at 1-844-801-2628 or click below to get started! We offer free estimates on all our gutter services in Willoughby, Mentor, Solon and the surrounding areas. Materials: Modern gutters are typically made from aluminum, as aluminum gutters offer a great combination of affordability, durability, and design choice. Color: Aluminum gutters offer the best options for color, as they are factory designed in a wide variety of colors and can be painted any color you want. Style: There are several different types of gutter profiles. Aluminum gutters are often formed in a "K" profile that includes a flat back section and a curved front. Half-round gutters are curved the whole way through and are sometimes be found on older houses. Size: K-style gutters typically come in 5-inch and 6-inch sizes. The larger size is usually specified when the roof area being drained is especially large and/or steep. Our gutter experts will help you determine which size is best for your house. Gutter guards: Gutter guards are an increasingly popular addition that provides excellent protection for your home. Also known as gutter screens, these covers prevent anything other than water from entering your gutters, eliminating clogs and cleaning. 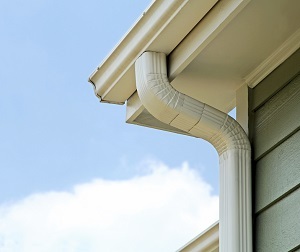 Additional drainage options: Depending on the layout of your home and yard, you may need a downspout extension to carry roof runoff away from the house. Many of these simply extend out over the yard or garden, while others consist of buried pipe that drains to a dry well or daylight outlet. We'll help you get custom designed gutters that perfectly fit your home's needs and style. If you're interested in gutter replacement or gutter installation for your home, the experts at RJK Construction Co. are here to help. Our experienced professionals will help you determine the right gutter services and materials for your needs and provide you with a quality installation. Call us today at 1-844-801-2628 or contact us online to get started on your gutter project. We offer free estimates on all our work in Willoughby, Mentor, Solon, Beachwood, Painesville, Chagrin Falls, Novelty, Perry, Chardon, Chesterland and throughout the surrounding areas. © 2019 RJK Construction Co.
RJK Construction Co. is an independent contractor and is not an affiliate of Owens Corning Roofing and Asphalt, LLC or its affiliated companies. THE PINK PANTHER™ & © 1964- Metro-Goldwyn-Mayer Studios Inc. All Rights Reserved.